2 studies are presented in this article. Let’s get started. 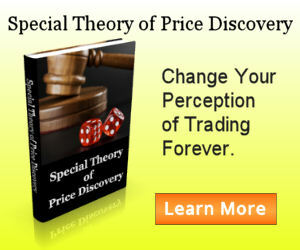 It is well known that the range of a trading period (i.e. a month, a week, a day), is highly correlated to the range of the trading period right after. The lesser known fact is that the extremes of the trading period are also great reference price levels with distinct statistical bias. Each instrument would have its own unique statistical profile that we can utilize in making our trading decisions. First, let’s look at the probability of price reaching a certain percentage of previous week range above previous week high and below previous week low. Given a week open within previous week range, the following table shows the statistics collected over 500 weeks. 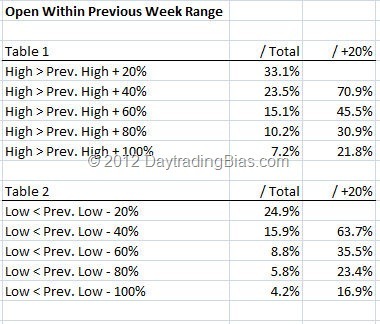 In Table 1, the first line tells us that after a week opened within previous week range, there is a 33.1% chance of reaching previous week high plus 20% of the previous week range. This information alone does not tell us much so far but the second line gets a lot more interesting. Once Euro has been able to trade at previous week high plus 20% of previous week range, it has a 70.9% chance of going higher to previous week high plus 40% of previous week range. The third line in the table tells us that the chance of reaching 60% dropped drastically to 45.5%. For the price to move to 80%, the chance dropped to just 30.9%. If you are not excited by this information yet, let me write this in plain English. First, a week that open within previous week range and traded through 20% above previous week high will very likely trade at the 40% mark as well. This is a roadmap for breakout trade. Second, a week that open within previous week range and traded through 60% above previous week high will be unlikely to trade at the 80% mark. This is a great precondition for counter-trend trading setup. In Table 2, the first line tells us that for weeks opening within previous week range, only 24.9% of the time price would go below previous week low by 20% of previous week range. But once that 20% mark is tagged, there is a 63.7% chance you will see the 40% mark. Although it is not as strong as the long side bias, it is still strong enough to watch out for should you choose to pick bottom. 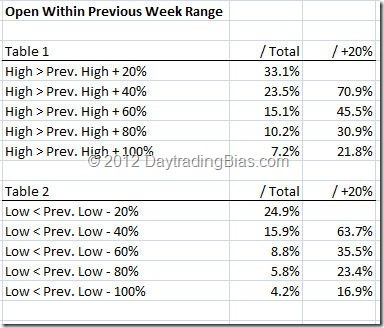 Note how 50% expansion of previous week range has been the line in the sand capping the weekly moves. In a way, the actual statistics from the data confirms STOPD’s principles. Similar to the statistics presented above, the following 2 tables show the statistics using exact number of pips away from the extremes. Notice how strong the biases are. Members only content, login now or sign up to view the rest of this article. Thanks for these posts and highlighting the general bias. I double checked your data across my own data bank and a variety of pairs and it seems fairly consistent. My problem with this is actually using the data. For example, while the odds of hitting +20p is very very high, this doesn’t usually happen on the initial break so if one was to use this as a bias, it becomes a trade management exercise to make it profitable – would you agree? Do you have any pointers on that? Have you check on those that break out the first time and comparing them to those that failed to grab the 20 pips on first try? The way the breakout was setup dictates the likelihood of getting the 20 pips at once, on next try, or fail. I guess I have to post the system afterall to clarify these things. Yes I have checked but it depends what you call the first try. For example, take a look at USD/CAD for the week. I know this pair was not on your posted study, but its a good example of the type of behaviour I mean. While it did hit the 20p, was it on the first try or not? I was looking at 60m chart…..
You need to switch to 5-min. I guess this was a flaw in my research becauseI tested this on my weekly data bank. This weeks GBP/USD is another example that would have boosted my research in favour but if you drilled down to intraday charts such as 5m, you’d probably have deemed this one as a failure. this week on cable is an excellent example. the first flush to prev week low is one of those exhaustion drop that can easily force a temp bottom and it did. notice until the condition is neutralized and “out of oversold condition” before you can get the clean drop that clears the level in 1 go. there is a reason why knowing the bias and applying it is different – you still need to workout the conditions for the bias to give you the trade. that depends heavily on your trading methodology. Yes, I narrated it after the fact like you mentioned above but took losses along the way – fairly small though. When I compare the 5min charts of each of the 3 breaks (the previous week break, then the following 2 attempts to make a new current week low) I fail to see too much of a difference. The only thing that maybe comes to mind is that Fridays attempt didn’t congest until after it was through Thursdays low (before continuing to go much much lower). The other 2 times it congested at the weekly low reference point. This is difficult to explain in a short comment. Are you good with basic chart reading techniques? The pattern we got last week is simply swing downtrend in 4 hours in force, the sell setup is very clean on that push back to retest resistance. This is the simplest explanation of what happened. Hi Lawrence.Very interesting and compelling stuff. Do you have statistics on the max adverse excursion of these trades and /or what kind of losses one can expect closing out at end of week on the trades that don’t hit targets.